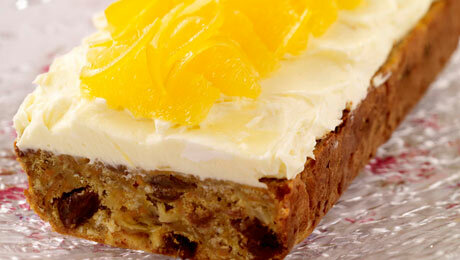 The fruit and almonds keep the cake very moist for a number of days. It makes a fantastic lunch box filler too. Preheat oven to 150°C/300°F/Gas Mark 2. Grease a 2lb loaf tin and line with a small layer of parchment paper to make it easier to turn out the cake later on. In a large mixing bowl whisk the eggs with the caster sugar until it becomes light and fluffy, when lifting your whisk a trail of batter should be visible. Next sift the flour together with the salt, ground almonds and mixed spice and add into the egg mixture, mixing very gently. Add in the carrots, pineapple, coconut, sultanas and butter at this stage. The consistency will be quite firm initially but as you mix in the flour it will loosen up a little. Pour into the prepared cake tin and bake for up to an hour or until a skewer inserted in the centre comes out clean. Peel the fruit carefully and using a sharp knife remove the bitter white pith from the rind. Cut the rind into long thin strips. Place half of the water into a pan and add the peel, bring to the boil. Strain the peel and discard the boiled water. In the pan add the remaining water, sugar and the strained peel, bring to the boil once more and allow to simmer for approximately 5 minutes until the peel has softened. Mix all ingredients together at high speed in a food mixer until light and fluffy. If you wish, you can remove the top layer of the cake to evenly spread the icing. Garnish with some pieces of segmented orange and candied orange and lemon peel.